My shop is currently closed until further notice! To receive a notification when and if I reopen, please sign up for my newsletter here. "The painting was beautiful and exactly how I pictured it! Everyone who has seen it, loves it!" "My husband and I LOVE the custom house painting that Michelle created for us! 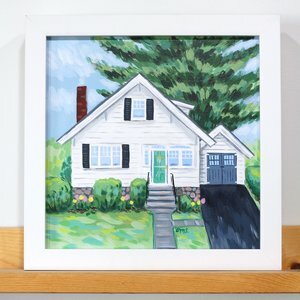 We recently sold our first home, so I surprised by husband with the painting of it. When he saw it, he cried (and so did I!)."